Life was just as brutal for the Yazidis—a religious minority persecuted for decades in northern Iraq—under former dictator Saddam Hussein as it is now under the threat from Islamic militants, contradicting recent claims about the former Iraqi government. The plight of the Yazidis attracted international attention in recent days as thousands sought refuge from the Islamic State of Iraq and the Levant (ISIL or ISIS), a jihadist group that has pledged to exterminate non-Sunni Muslims who do not convert. The potential for genocide prompted President Barack Obama to order airstrikes and airdrops of food and water. Some commentators on both the left and right are now arguing that the United States and Iraqis were better off with the government led by Hussein, who they view as a secular and more tolerant leader. American forces toppled the dictator when they invaded in 2003, and he was executed in 2006. However, the Yazidis had to fear for their lives and safety during Hussein’s reign. The religious sect was a casualty of Hussein’s devastating campaign against Kurdish rebels in northern Iraq, which included a poison gas attack that murdered thousands of women and children in 1988. Iraqi forces destroyed about 100 Yazidi villages during the campaign, the New York Times reported in 1993. "About 10,000 Yazidi men died fighting for Iraq in the eight-year war with Iran," the Times reported at the time. "And several hundred Yazidis disappeared at the hands of the Iraqi secret police during the last 15 years." 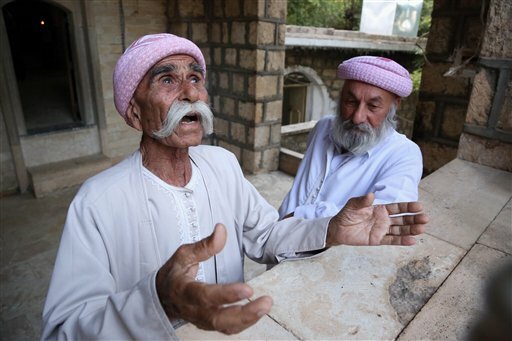 About 150,000 Yazidis in areas controlled by the government were cut off from their group’s ancient shrine in the northern Lalish Valley after the campaign against the Kurds. Michael Rubin, resident scholar at the American Enterprise Institute (AEI) and a former Pentagon adviser on Iran and Iraq during the George W. Bush administration, said in an email that the Yazidis, as part of the Kurdish minority, "were subject to Saddam Hussein’s genocidal campaign." "People forget that Saddam Hussein was an ethnic and sectarian chauvinist," he said. "Life might have been good if you were from Saddam’s tribe or more broadly a Sunni Arab nationalist, but if you were a Kurd or a Shi‘ite, forget about it." "According to London’s The Guardian back in 2002, one-in-six Iraqis fled Iraq under Saddam Hussein," he added. "They weren’t fleeing because they loved their dictator." The Yazidis have long been persecuted for their eclectic beliefs. They believe that Melek Taus or the Peacock Angel, known in other faiths as Satan, should be a revered figure because he repented after disobeying God. Although they deny being "devil worshippers," they have long lived under the threat of genocide. The Ottoman Empire carried out dozens of massacres against them in the 18th and 19th centuries. Hussein’s offensive against the Kurds and Yazidis later morphed into a "Stalinesque forced migration program," the Chicago Tribune reported in 2003. Hussein moved thousands of loyal Arab families into Kurdish regions of northern Iraq in a campaign known as "Arabization." About 100,000 people were pushed out of oil-rich territory between the cities of Mosul and Kirkuk, including Yazidi, Turkmen, and Assyrian minorities. The Yazidis also have branches in Turkey, Syria, Iran, and Germany. Experts say Iraq still lacks a pluralist leader that protects religious minorities. Prime Minister Nouri al-Maliki refused to step down on Monday after Iraq’s new president nominated the deputy parliament speaker to form a new government. Maliki, a Shiite, has been accused of inflaming sectarian tensions by persecuting Sunnis. This entry was posted in National Security and tagged Iraq. Bookmark the permalink.